How? How did I miss this one? Back in late 2011 I was sitting in my apartment, the entire night ahead of me and I was considering leaving my warm living room to brave the cold streets in order to check out The Trip at a local Rep cinema. Well, the warm apartment won out and it’s taken me this long to actually see the film; I’m kicking myself. First a brief synopsis and then I’ll explain why I’m in love with The Trip. 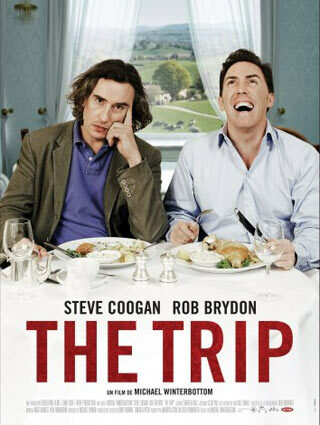 The Trip follows Steve Coogan and Rob Brydon, who play themselves, as they embark on a road trip in England in which they will be stopping at fine restaurants and sleeping in cozy inns. This entire trip is completely free of charge as Coogan has been asked by The Observer to write about his experience. Coogan was supposed to bring his young and attractive girlfriend, but she has backed out at the last minute. After trying a multitude of people he settles on inviting Brydon, who accepts. This turns out to be an unwise choice for Coogan as Brydon fills most of the silence in between courses with a plethora of impressions. Behind his annoyance with Brydon lies more serious problems for Coogan, he’s getting older and hasn’t settled down; the family oriented Brydon seems like his complete opposite. The subject matter of The Trip is not the most dramatic and certainly not the most serious. In fact, as a narrative The Trip is not very strong at all, but the narrative (mostly improvisation from what I understand) is not why I enjoyed The Trip so immensely. Depending on our interests we all have real life individuals that we would love to listen to in an everyday context, when the lights, cameras, or whatever are not focused on them. I’m not saying that I’m a lifelong fan of Coogan or Brydon, but I do have a huge interest in film, and it was amazing to feel like an unnoticed third member at their dinner table as they joked, bickered, and spoke to each other with candor. On top of that, the film is filled with impressions by the two stars, many of which are quite good, but even the bad ones are hysterical to witness. If the conversations between Coogan and Brydon were played out in front of a large audience, The Trip would feel empty. It’s the intimate locations at dinner tables across the beautiful English countryside that makes the viewer feel like they have a VIP ticket for a meal with two incredibly funny actors. If you require a dramatic storyline or a fast moving film, look elsewhere. On the other hand, if you would like to witness something very different and incredibly entertaining for what it is, under no circumstances should you miss The Trip.